The elegant Malone water feature has been carefully hand carved and chiselled by skilled craftsmen exclusively for Aqua Moda. The twisting, curved lines of the granite naturally draw the eye and the included LED lighting transforms its appearance in the evening. As the water jet glimmers and flickers like a flame from the strong LED lights, the gentle trickling water produces a calming and relaxing atmosphere in your garden. The Malone should not be mistaken for hollow terrazzo reproduction stone sphere water features. it's produced from solid natural granite, so every feature is unique and will last for years to come. This product is complete with pebble pool and decorative river cobbles to decorate the top of the pebble pool. Hand carved solid granite craftsmanship. Estimated 2-3 working days delivery. 800mm tall x 220mm wide x 220mm deep. 2ft 7.5ins tall x 8.7ins wide x 8.7ins deep. Water pump with 10m cable. 66cm Diameter Reinforced Heavy Duty Pebble Pool. Malone Granite Water Feature Kit - customer reviews. 30 Jul 2017 Malone by Aqua Moda Granite Water Feature With LED Lights Pebble Pool and Cobbles Kit An attractive, quality product. I am very pleased with it. 4 Jul 2016 Malone by Aqua Moda Granite Water Feature With LED Lights Lovely feature in our new garden. "Really pleased with the product. it looks spectacular, especially when the light starts to fail. However, assembly instructions would have been useful and appreciated, particularly in regard to the (optional) granite safety support. A major problem was that the hole in the base plate of the safety support was too small for the water pipe supplied with the water feature. As a result it was necessary to drill a larger hole to allow the pipe to be threaded through. Also, there was no hole in the other base plate so a second hole had to be drilled so that the pipe could be lowered into the water reservoir. Lacking an instruction sheet this seemed to be the best solution. The service provided by the seller could have been better. 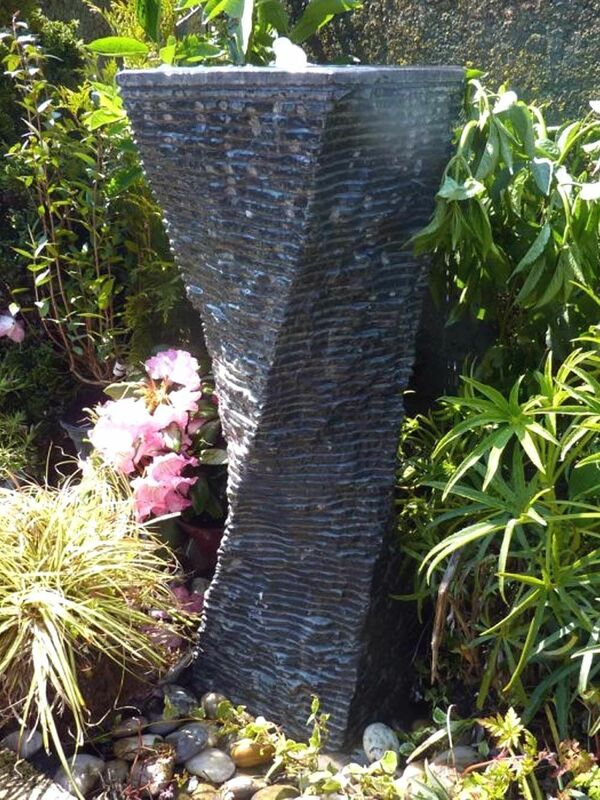 Although the safety support was ordered at the same time as the water feature itself, we were not informed on delivery that the safety support was not in stock and we only discovered it was missing when starting to install the water feature. We had to wait more than 2 months for this to arrive, and had to chase it up with the seller. My overall rating reflects the problems above, but we are now very happy with the final result."